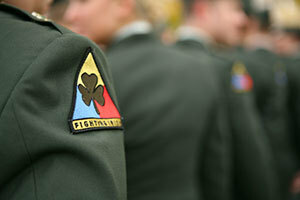 The University of Notre Dame’s Army Reserve Officers’ Training Corps (ROTC) department has once again won one of eight MacArthur Awards, signifying the top Army ROTC programs in the nation, for the 2011-12 academic year. The awards, presented by the U.S. Army Cadet Command and the Gen. Douglas MacArthur Foundation, recognize the ideals of “duty, honor and country” as advocated by MacArthur. The Notre Dame program, which also won the award last year, represents Cadet Command’s Seventh Brigade, which consists of the 38 senior Army ROTC programs in Michigan, Ohio, Indiana, Tennessee and Kentucky. The award is based on a combination of the achievement of the school’s commissioning mission and its cadets’ performance and standing on the Command’s national Order of Merit List and its cadet retention rate. Cadet Command and the MacArthur Foundation have given the awards annually since 1989. Originally published by Notre Dame News at newsinfo.nd.edu on February 21, 2013.